Being Queen keeps a girl busy. Yesterday was the Krewe of Nauga party. Several of the girls are talking about finding out if this party can go into the Guinness Book of World Records as the largest pajama party in the world. It begins on Saturday at 10 a.m. and ends kinda sorta around 2 p.m. 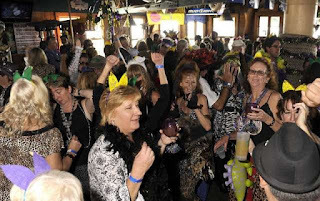 It is held in one of the beach bars and the place is packed and overflowing onto the beach. Luckily, our weather lately has been beautiful fall weather. It is a come as you are party/pajama party/costume party. They serve a breakfast buffet and the booze is flowing. You could easily stand in line for nearly an hour to get in. 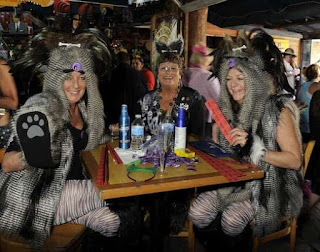 After Nauga, I returned to Krewe Den to work and watch the girls trickle in from the parties. Yes, after Nauga there is another party at the Sandshaker, across the street. The girls returned with all kinds of stories and laughter. Today I returned to Krewe Den to work some more. The whole krewe was there working on the float, on the dance, on costumes, cooking and socializing. We had a great time. I even received my 6th crown, the sleeping crown. Mardi Gras jackets are starting to pile up in the studio. Everyone needs decorations and logos embroidered. These things are so much fun to embroider. We did have an embroidery scare. Boudreaux stopped working. At first we thought Boudreaux was dead but the tech is coming tomorrow and thinks he can repair Boudreaux. I sure hope so because we have work orders backing up. A couple of friends visited last week. It was such a joy to have them over. They got the tour of the house next door, the garden, and met the dogs. It is always pleasant to have friends visit, especially friends that you don’t see on a regular basis. Sorry for such a short edition but work has to be done. For a more elaborate design, trace out a reverse pattern on the white backing of the Treasure Tape sheet (we drew swirls). Cut out. Remove the white backing and lay the design on the mask. Lay Treasure Tape dots randomly on the mask. Remove the red liner to expose the sticky top, and lay a sequin on each. Lay the mask in a shallow pan or tray and cover any remaining sticky areas on the dots with Diamond Beadlets. Remove the red liner from your larger tape areas, and begin decorating: add thread first, using the #12 Braid to outline the area or make other designs . Then add sequins if desired. When decorating is complete, cover remaining sticky areas with Diamond Beadlets. Friday night was one spectacular Moon Pie Party. I learned that my King is even more social than I am. When I awoke very late Saturday morning my body screamed “PAIN.” My knees and back were throbbing. It was nothing an Advil couldn’t cure. There are pictures of the party all over the internet but if you really want to see some good pictures go to www.pensacolabeachmardigras.com and look in the Photo Gallery. It turns out that my King John lives only 2 or 3 blocks from my home. John is a wonderful King and I wouldn’t trade him for all the tea in China. However, he has me going to so many parties that I don’t know if I can keep up with him. Not to mention he is very artistic and began decorating our Krewe Den and has started bringing costume pieces to my house. Whoa there, Your Highness. Pace yourself. No joke it is wonderful being Queen and, as you can imagine, I’m making the most of it. The krewe is my Royal Court and each has a Royal Title, as well as each has their own little tiara. Hey, I couldn’t be queen without these girls. They should share some of the glory. As a little sideline to the Moon Pie Party, when George and I were leaving the house on Friday we saw a gray truck pull up in front of our house. Something about it looked suspicious and the further we got down the road, the more bothered we were. We contacted neighbors and conveyed our concerns and were able to continue to the party without worry. It is good to know and befriend your neighbors. They’ve come to our rescue more than once. For most people tomorrow is a holiday but I will be working on a beautiful antique linen bedcover. Hopefully it will be finished this week. It is just beautiful. The project has been ongoing for several weeks and poses a real embroidery challenge. I surprise myself when one of these projects that “couldn’t be done” is finished and the customer is pleased. There is a great sense of satisfaction. We did hit a bump in the embroidery road, though. One of our embroidery machines is acting up and George is on a quest to fix the thing. Tomorrow will be day three of this quest. If it isn’t fixed by Tuesday, I guess we have to either send it to Tampa or get a tech to come here. Either way is very expensive. We need it fixed because George is in the middle of a pretty large order and more in line after that one is done. If it doesn’t get fixed soon, he’ll have to use my Amaya which will stop my work flow. Thank goodness we have two machines. Measure the circumference of your head at the level just above your eyebrows using the cloth measuring tape. If you know your hat-size in inches (or cm. ), you can use that figure instead. Cut a length of black elastic equal to the circumference you measured for your head plus 1/2-inch. Sew up the extra length by overlapping one end over the other end to form a closed loop that will fit around your head snugly. To ensure that it doesn't come apart, sew the two ends securely together, stitching in a square pattern and then stitching an "X" through it. Attach the end of one string of beads to the outside surface of the elastic headband so that the other end hangs down freely. Use a small quantity of hot glue to do this, making sure that you use enough to securely attach the beads without making it a gloppy mess. Glue more beads at small, even intervals around the outside of the headband until you get back to the first one. You may prefer to sew a stitch or two around the base of each bead to secure each one to the headband (before applying the glue). This may be stronger than glue alone, if you know you'll be wearing the headband for long hours. In one part of the headband (about 1/3 of its total length), cut off the strings of beads a few inches below the elastic. This will be the front of the headdress, with the bead strings cut short to keep from obstructing your vision . Glue strings of beads across the circumference of the headband, from one side to the other in a cross-hatch pattern to form the top of the headdress. Make sure there is enough extra length in these bead strings to fit across the top of your head. · Black elastic is available at craft stores. · Mardi Gras beads are available online, at most costume shops or the costume section at party supply stores. · If you like, you can use a pattern other than cross-hatching for the top of the headdress. This detail is important because it will both conform to the shape of the top of your head and keep the elastic from sliding down due to the weight of the beads attached to it. This past week was full of puff embroidery. Actually it was more the perils of the P. We digitized a beautiful P monogram that was to puff. Around the bottom of the P were some floral designs. I guess they were too tiny and in a fill stitch, rather than a satin stitch. Those little tiny pieces of foam just would not go away completely. No matter how many times I stitched that thing out, there were little pieces of foam that refused to come off or hide beneath the thread. By the end of the week, I just threw my hands in the air and decided this design just would not be a puff design. A nice weekend away with the girls and I have a new plan for the P that I will try out. As a business, you must be flexible. The products in our Etsy store were going to be limited to scarves and handkerchiefs; however, those little in-the-hoop purses seem to sell very well. At least so far they do. The two little purses that have been listed each sold within a couple of weeks of the posting. A third one was listed last week. Time will tell how that goes. The store may have three categories, rather than two. The only thing that is bothersome about the little purses is the shoulder strap. The shoulder strap should be strong enough but flexible, so webbing was used. The webbing is attached using metal grommets. The perfect place to attach the webbing would be on opposite sides of the purse but the seam gets in the way. The strap has been placed in the back of the seam, in the front of the seam, on the inside of the purse and on the outside. No one has complained so far about the placement but it does bother me. A friend of mine commented the other day that I was continuing Mama’s tradition. Since Mama was known as Madame Queen, it is only proper that I should become Queen, too. So far in my reign we have had a fabulous time. The krewe is going to be my Court and each member has received a Royal title. It is not fair that the King and Queen are the only ones with crowns, so, the krewe has each received a tiara from the Queen – much smaller than my crowns, of course. That’s only proper. Yesterday we went to Dynasty, which is a company in Mobile that sells rhinestone pins, jewelry, crowns, scepters, etc., to many krewes from Florida to Louisiana. There I purchased my Krewe Krown. It is a gorgeous fleur de lis crown. The fleur de lis is my royal signature design. This coming Friday evening is our Moon Pie Party. It is open to the public, so everyone should come out to the Sandshaker on Pensacola Beach and join the festivities. Speaking of crowns, when I purchased the tiaras for the krewe, I simply had to purchase another crown for me. They were so pretty. I have a cute little tiara that I’ve had for many years. Well, to make a long story short, I now have 4 gorgeous crowns. Frankly, I do picture a different crown for each day of the week. Not to mention that they do look good on me. I think my head was built to wear a crown. I haven’t found one that wasn’t extremely comfortable. Although my signature royal design is the fleur de lis, I thought it would be appropriate if I handed out smiles, rather than beads, for Mardi Gras. I purchased little foam smiley faces in the shape of a star as my special hand out. The intent is to spread smiles across the beach. We are picking tomatoes and bell peppers in January. Can you believe this weather? This past weekend was shirt sleeve weather in the 60s and 70s. Last Thursday night was the Champagne Queen party at a friend’s home on the beach. Everyone was to decorate their champagne glass and the winner received a prize. One of the prizes was a little pink purse that Cajun Stitchery embroidered. It was so cute. A good time was had by all and we hope this party becomes an annual tradition. This week we are going to begin embroidering caps for a really nice order that was received for a gentleman’s fraternity alumni. The order is for 65 ball caps. This may be our biggest ball cap order yet. Can’t wait to get this one done. Materials: three yards of grosgrain ribbon, one 12 inch piece of grosgrain ribbon, one thin piece of ribbon or floral wire. Step 1: Begin the Dior Bow Tie by winding the ribbon back and forth to form three loops. To do this, first form one loop. Holding the loop at its midpoint, wind the ribbon underneath to form another loop that is slightly larger than the first. Now hold both of the loops together at their midpoints and wind the ribbon underneath in the opposite direction to form a final loop, again slightly larger than the previous. Step 2: To secure your loops, tie a knot around the midpoint with a thin piece of ribbon or floral wire. Step 3: With a separate piece of ribbon about 12” long, wrap around the knot you just made, tying a double knot on the backside of the bow. Pull down a piece of the extra ribbon on each side of the bow to form the bow’s tails. Step 4: Trim the tails to your desired length. Use crimping scissors to add a decorative finish on the ends of the tails. Step 5: Attach the bow to your gift with double-sided tape or tie the bow directly to another ribbon on your package. George ended up spending the week in Atlanta with his sister and dad. They buried Mom on Friday. George says it was a very nice military funeral. They folded and presented the flag to Dad, played Taps, and the Navy officers escorted Dad. It was a difficult week. The New Year holiday made it a bit difficult getting the funeral plans finalized, but in the end they did what had to be done. On top of everything else, George’s birthday was Wednesday, the day they received Mom’s ashes. George and his sister left Atlanta yesterday morning. A lot was done at Cajun Stitchery during the week. The dogs, cats and I spent the week alone with an occasional visit from neighbors. We were able to churn out some beautiful embroidery though and work on some creative designs. This upcoming week already looks busy with more heirloom embroidery and a large ball cap order. Sometime ago a friend told me to sell no more than 4 or 5 different types of things in your store. Just have a lot of each of those things. Etsy allows 10 categories of items in each Etsy store. My new embroidery friend in Alaska reiterated this to me. She has over 1,000 items in her EBay store. They are all embroidered towels, mostly hand towels, and a few bath towels. Her EBay store is booming and keeps her busy everyday. Reviewing our Etsy sales from last year it appears that the one item that sells most is handkerchiefs. Our plan is to build up our handkerchief supply and turn our Etsy store into just handkerchiefs or handkerchiefs and another item, perhaps scarves. That is Step 1. Later on we may open a second Etsy store for a couple of additional categories. The Etsy rules do allow you to have more than one store but they make a point that they do not encourage this practice because it can become confusing. Now the question is what to do with the other items that I make. Yesterday was the Queen’s Brunch for our krewe. We get together over mimosas and bloody Mary’s, eat a fabulous brunch, socialize and then our past queens retire to a private room where the envelope containing our votes and kisses are tallied for our new queen. Only the past queens know who will be the new queen until the announcement at the King Kake Party. 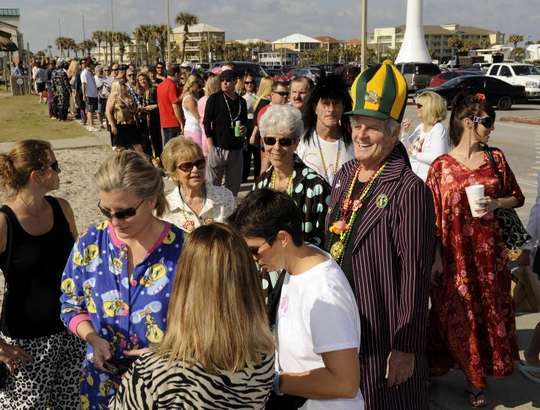 We usually begin the Mardi Gras season on the island with our King Kake Party that same afternoon. At that time we serve King Cake and then announce our new king and queen. This year John Thomas was crowned King Nerius XXII and Peggy Henshall was crowned Queen Doris XXII. It was simply a magical day for me. Those girls are the very best. I really like the tiara a lot. I wore it until bedtime last night. Actually I wore it to bed but it wasn’t comfortable sleeping with the thing on my head. The tiara returned to my head this morning and I wore it all day. I began designing my royal logo last night and posted it on Facebook. We also found that the Pensacola News Journal wasted no time in publishing an article on our party before the evening was over. Today we had a birthday meal for George at a friend’s home. I wore the tiara. Food was great. Conversation was wonderful. We had a lovely afternoon. The General went out to find that none of his G.I.s were there. One finally ran up, panting heavily. "Sorry, sir! I can explain, you see I had a date and it ran a little late. I ran to the bus but missed it, I hailed a cab but it broke down, found a farm, bought a horse but it dropped dead, ran 10 miles, and now I'm here." The General was very skeptical about this explanation but at least he was here so he let the G.I. go. Moments later, eight more G.I.s came up to the general panting, he asked them why they were late. "Sorry, sir! I had a date and it ran a little late, I ran to the bus but missed it, I hailed a cab but it broke down, found a farm, bought a horse but it dropped dead, ran 10 miles, and now I'm here." The General eyed them, feeling very skeptical but since he let the first guy go, he let them go, too. A ninth G.I. jogged up to the General, panting heavily. "Sorry, sir! I had a date and it ran a little late, I ran to the bus but missed it, I hailed a cab but..."